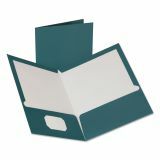 Oxford Two-Pocket Laminated Folder, 100-Sheet Capacity, Metallic Teal - Two-pocket folders enhance reports and presentations. Made of long-lasting, metallic-coated, laminated material. Business card holder is die-cut and located on the inside pocket. 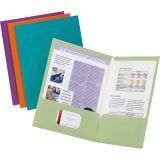 Each folder holds 100 sheets with 50 sheets for each pocket.